by Dimitri Malsam – Keysight Technologies, Inc.
What criteria would you use to select a new vehicle? These days, your answer might have something to do with the vehicle’s added features, like mobile Internet access, traffic sign recognition and radar. This fact brings up an interesting point. While engine power and vehicle size are still critical decisionmaking factors, they are no longer consumers’ top priorities. It’s this trend that is fundamentally challenging automakers in their concepts. Why Testing for Immunity to Power Transients? With the steadily growing number of electronic assistants, both power consumption and electromagnetic emissions are on the rise, which can lead to unwanted influences on the vehicle’s electronic components. It seems hardly surprising then that there are global standards to ensure correct operation of the vehicle’s modules. Such international standards include ISO 7637-2 and ISO 16750-2. There are also working standards from vehicle manufacturers, which are derived from the international ones and must be followed by all suppliers. The standards describe in detail the test requirements, setups and methods required to comparably and reproducibly inspect components, assemblies and accessories. Imagine the following situation: you are stopped at a traffic light and the engine of your vehicle is turned off by its start-stop system while you are on a phone call. The light turns green and as soon as you step on the gas pedal, the engine automatically starts. At this point, the hands-free phone connection must not fail. To test its reaction, the crank test is simulated as shown in Figure 1. For the most realistic tests, the norms define the fastest voltage variations along the source leads during an engine start. Currently, there are a number of providers, devices and test systems that can test these standards at different levels. The services range from pre-compliance testing to full compliance testing. Full compliance test systems are able to generate and validate all waveforms specified in the relevant standards. These tests are very complex and therefore, often expensive. Moreover, they offer little flexibility to adopt to norm modifications. Frequently, such testers are used at the end of the product development cycle and mostly in specialized, certified test labs. Pre-compliance tests are usually carried out during the development phase of a product. These tests are easier and cheaper to implement, while covering a large part of the full compliance testing. They allow engineers to detect any early trends, as well as how a subsequent full compliance test will result. Consider the example of a pre-compliance tester that is flexible, easy to use and provides valuable additional features. It also is lower in price compared to a full compliance solution. The core of the system consists of an arbitrary waveform generator that can create all types of signals. This signal generator must be powerful enough to generate the high voltages and current required by the standards. Separate software creates the desired waveforms and loads them into the signal generator, thereby simplifying the test procedure. During testing, the device under test (DUT) is monitored for functionality. Consequently, it is useful to be able to continuously capture and store current/voltage data. From this data, engineers can conclude the DUT’s response to the various standard tests. Ideally, a typical test system setup will include a powerful arbitrary waveform generator, A/D converter for signal acquisition, and software to control the testing and enable ease of use. For the tests described above, choose a multi-functional power supply, such as one from Keysight’s N7900 or N6700 power supply families. These power supplies provide a powerful arbitrary waveform generator with a sample rate of 100 kSa/sec. Depending on the model, it achieves rise and fall times of up to 350 microseconds, which qualifies for the generation of the most ISO norm pulses listed above. The memory, with its 65.535 sample points, is sufficiently deep and allows the import of regular CSV files from the waveform library. Two built-in A/D converters seamlessly use multiple ranges for measurement acquisition in real time. 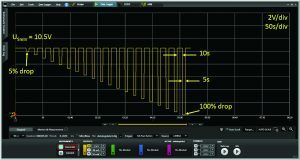 As a result, the modules can produce clean signal measurements without “polluting” them with the artifacts that would come from switching the measurement ranges. 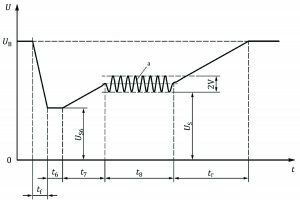 This high level of integrated measurement functions reduces the engineer’s efforts for setup of the test environment, while also improving measurement accuracy and repeatability. 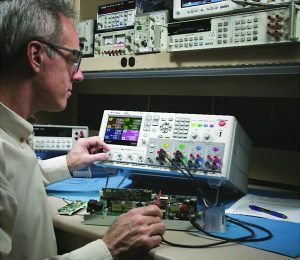 Control of the test itself, and the associated hardware, is accomplished via Keysight’s 14585A Control and Analysis Software. The software runs on an external Windows-based PC that has been outfitted with the software’s comprehensive ISO signal library. The 14585A control software can control up to 4 devices at the same time. Its key capabilities include generating different arbitrary current or voltage waveforms, capturing and analyzing the waveform at the terminals or sense lines, and documenting measurement results, as well as editing and re-playing them with the software’s record and playback function. Complex signals can be created via the software’s included library of functions (e.g., sine, trapezoidal, pulse, sinc function, sweep, noise, and many more). All provided functions can be parameterized and combined to form a complex sequence. Figure 2 shows an example of an “ISO 16750-2: Reset 4.6.2 Behavior at Voltage Drop” test pulse that was built from individual pulses in the software library. More sophisticated waveforms, such as “ISO 7637-2: 5.6.2 Test Pulse 2b Motor Transient Generation,” are available in pre-configured CSV files, which can be imported and run directly (Figure 3). 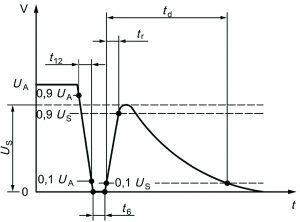 The biggest challenge in creating this waveform is calculating the double-exponential decay in the second part of the test pulse. In Figure 3, the calculation of the signal was carried out using a dedicated program and subsequently inserting it into the CSV file to support the end user. Alternately, other more sophisticated waveforms can be created directly in the 14585A software using its built-in ARB formula editor (Figure 4). With the same software, the engineer can even record the electrical feedback of the DUT to the test profiles. An oscilloscope and data recorder functions are required for this feature. In scope mode, the user can capture intermittent events, such as the transient response of the DUT to a voltage pulse. The data points in this scanning mode are digitized with an interval of 5 microseconds. Using the data logger operation, the engineer can study the longterm behavior of the device with the same sampling frequency as that of the scope function. However, one data point is the result of an integration over multiple data samples. Within each integration period, the minimum and maximum values are also logged. This ensures that there are no drop outs during the capture, but also that the extreme values are registered. The combination of hardware and software described above allows the user to quickly and easily generate most of the required standard waveforms needed to detect the response of the DUT and document the results. For tests at higher electrical power, it is possible to connect multiple Advanced Power System units in parallel and start them synchronously. Using the test system presented in this article allows the user to test prototypes in a simple and fast way for compliance with the ISO 7637-2 and ISO 16750-2 standards, as well as with derived standards like LV 124. It offers users the ability to react to potential problems early in the development cycle, saving valuable development and rework time, and in turn, reducing overall development costs and time to market. The presented solution is scalable, depending on the required power levels, and can be easily controlled from a single software tool. Waveforms can also be easily adjusted. Furthermore, the modularity and expandability of the system make it a safe investment that’s fully protected against future modifications of the standards.